University Medical Center Utility Building — Morphy, Makofsky, Inc. 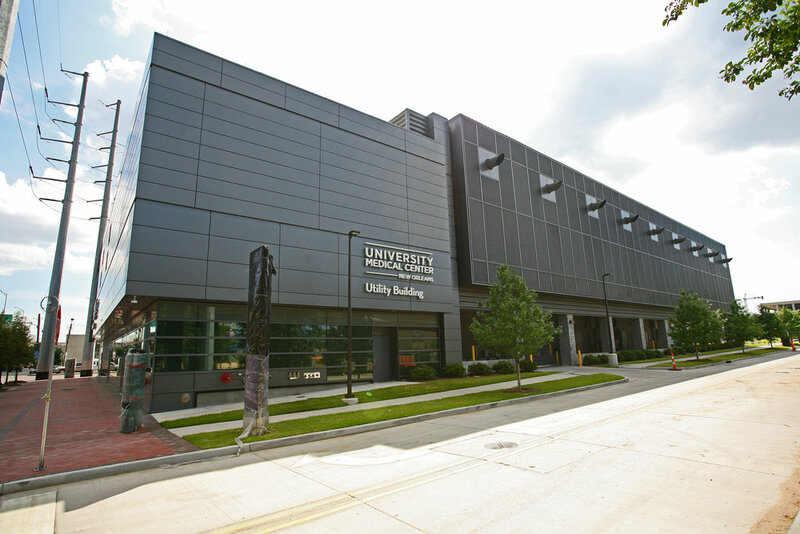 The LSU UMC Utility Building is a two-story complex that houses the generator farm, electrical gear, fire pump, and emergency water supply for the new University Medical Center in New Orleans. The generator farm contains nine generators and their respective fuel tanks forcing the second floor slab to have a 450 psf live load design. The slab beneath the massive water tank, holding approximately 800,000 gallons of water, was designed for 1,800 psf. The entire complex is supported by a reinforced concrete slab with one way beams on top of a system of 100 ton precast pre-stressed concrete piles running 95 feet deep.